Fall turns on like a switch in the Montana high country. The calendar hits September and the days are shorter, the mornings colder, and the talk turns from fire to snow. Hunters are giddy. Runners experience it too. Morning runs feature steam lifting off creeks and aspen and larch start to reveal their autumn gold. Then we hear it; the bugle. It might be a faint echo off a canyon wall, but we know the rut is coming and that the mountain giants are headed to battle. This Saturday, on the slopes of Big Sky Mountain Resort’s Lone Mountain, the trail running community will experience its own fall showdown. 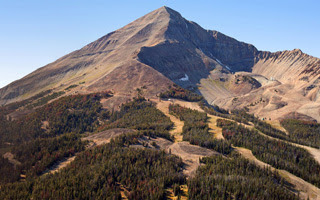 Runners will test their abilities on one of the most challenging mountain 50Ks in North America. Like the seasonal elements that combine to bring the elk into a frenzy, a unique combination of people and place collide to give us The Rut. Clearly, the Mikes go big. Given the prominent place The Rut is taking in Montana’s running scene before the starting shot is even fired, it should come as little surprise that these race directors have a lot more in store for us. With an eye toward the future, they not only envision The Rut expanding, but becoming a premier U.S. event in the Sky Running Federation World Series of Mountain Running. Talks are underway to develop a Skyrunner-style 3-day festival of mountain running featuring a Vertical Kilometer (a 3,000 foot ascent race in less than 5K to the summit of Lone Mountain) which, along with the marquee 50k, would draw a top international field. Although we can expect the event to grow, the Montana faithful can be assured that the Mikes will keep the event true to its Montana roots: big, beautiful, and rugged. Luke Nelson, Pocatello… fresh off a strong 6th place showing against a stacked field at the challenging Speedgoat 50K, this Patagonia athlete and world class ski mountaineer is well suited for the steep Lone Mountain terrain. Jeremy Wolf, Missoula… MTC’s own, Wolf has proven his speed with podium finishes at numerous Montana trail races over the past two seasons and recorded a 3:38 50K trail debut in April. A missed turn led him to drop from Speedgoat, but his recent training (see Glacier loop) suggests he’s ready to throw down another solid performance. Jeff Rome, Livingston… an experienced ultra-runner at age 24, Montana mountain running suites him well as evidenced by his 3rd place finish at this year’s Bridger Ridge Run. He followed that up a week later with a sub 21 hour finish at the Leadville 100. Zack Strong, Bozeman… the former Dartmouth steepler is past champion of numerous races throughout Montana, including the Bridger Ridge Run, Pengelly Double Dip, and Montana Cup. Matt Shryock, Missoula… 2:36 marathoner, 1:09 half marathoner, and competitive triathlete. Mark Handelman, Missoula… 2:42 at 2013 Missoula Marathon and winner of 2013 Pengelly Single Dip. Cheryl Beatty, Calgary… Winner of numerous 50Ks and champion of the 2013 Ultra Trail Lavaredo in Italy. Minde Erickson, Bozeman… 2012 Bridger Ridge Run Champion, 2013 runner-up. The Rut 50K & 12K - By Sprout Films from Sprout Films on Vimeo. Keep an eye out for local athlete Melinda Turner in Saturday's 50K. This is nice blog that let me remember when i am with my family while visit at Climb Mount Meru, a real mountain trip that amazed with me and let my hope to enjoy againa and again.